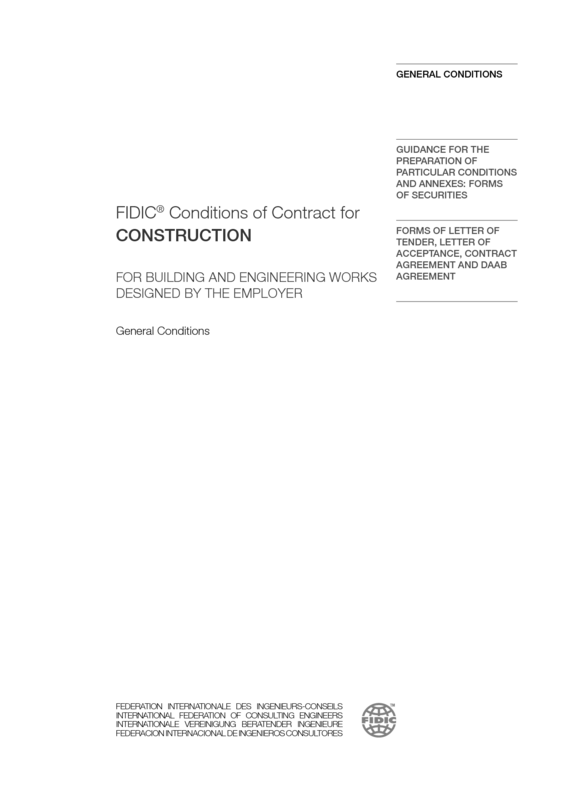 Conditions of Contract for Construction (Second Ed. 2017). For Building and Engineering Works designed by the Employer. 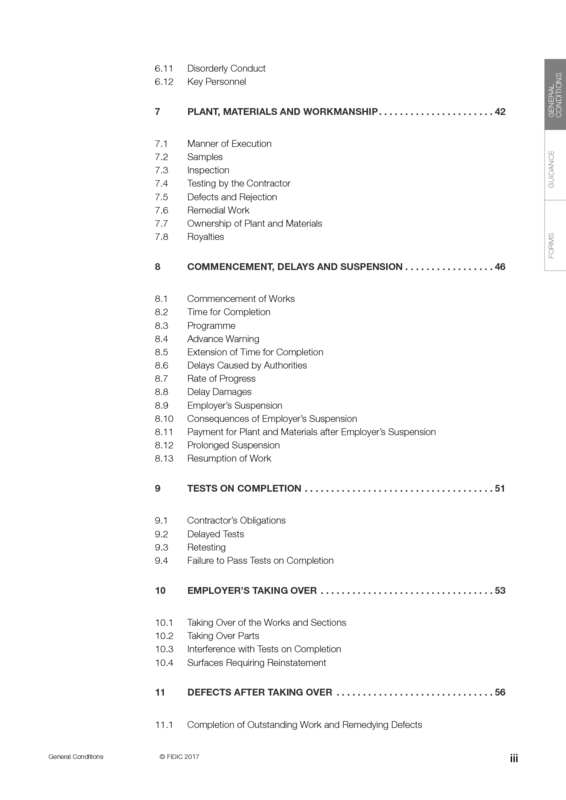 General conditions; Guidance for Preparation of Particular Conditions; Forms of Letter of Tender, Letter of Acceptance, Contract Agreement and Dispute Adjudication/Avoidance Agreement, etc. 4) detailed provisions for quality management, and verification of Contractor’s contractual compliance. 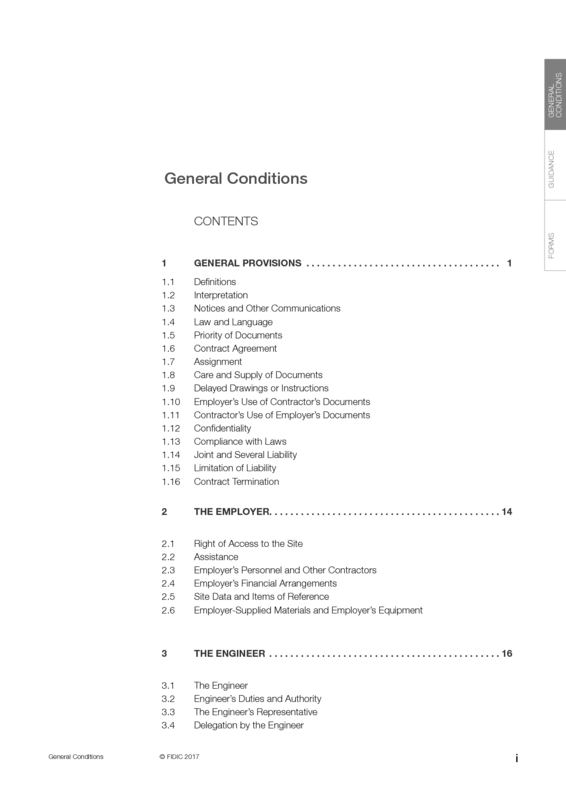 These Conditions of Contract for Construction include conditions, which are likely to apply to the majority of such contracts. Essential items of information which are particular to each individual contract are to be included in the Particular Conditions Part A – Contract Data. In addition, it is recognised that many Employers, especially governmental agencies, may require special conditions of contract, or particular procedures, which differ from those included in the General Conditions. These should be included in Part B – Special Provisions. It should be noted, that the General Conditions and the Particular Conditions (Part A – Contract Data and Part B – Special Provisions) are all part of the Conditions of Contract. To assist Employers in preparing tender documents and in drafting Particular Conditions of Contract for specific contracts, this publication includes Notes on the Preparation of Tender Documents and Notes on the Preparation of Special Provisions, which provide important advice to drafters of contract documents, in particular the Specifications and Special Provisions. In drafting Special Provisions, if clauses in the General Conditions are to be replaced or supplemented and before incorporating any example wording, Employers are urged to seek legal and engineering advice in an effort to avoid ambiguity and to ensure completeness and consistency with the other provisions of the contract. This publication begins with a series of comprehensive flow charts which typically show, in visual form, the sequences of activities which characterise the FIDIC Construction form of contract. The charts are illustrative, however, and must not be taken into consideration in the interpretation of the Conditions of Contract. This publication also includes a number of sample forms to help both Parties to develop a common understanding of what is required by third parties such as providers of securities and guarantees. Drafters of contract documents are reminded that the General Conditions of all FIDIC contracts are protected by copyright and trademark and may not be changed without specific written consent, usually in the form of a licence to amend, from FIDIC. If drafters wish to amend the provisions found in the General Conditions, the place for doing this is in the Particular Conditions Part B – Special Provisions, as mentioned above, and not by making changes in the General Conditions as published. FIDIC considers the official and authentic texts to be the versions in the English language. FIDIC Contracts Committee’s Updates Special Group: Zoltán Záhonyi, Z&Partners Consulting Engineers, Hungary; Siobhan Fahey, Consulting Engineer, Ireland (Principal Drafter); Christoph Theune, GKW Consult GmbH, Germany; and William Howard, CDM Smith, USA (Executive Committee liaison). Initial Update Task Group: Svend Poulsen, Atkins/COWI, Denmark (Group Leader); Aisha Nadar, Advokatfirman Runeland AB, Sweden (task group principal drafter); Robin Schonfeld, SMEC, Australia (task group principal drafter); Darko Plamenac, Consulting Engineer, Serbia; Jan Ziepke, Consulting Engineer, Germany; and Zoltán Záhonyi, Z&Partners Consulting Engineers, Hungary (Contracts Committee liaison). Second Stage Update Task Group: Simon Worley, EIA Ltd., UK (Group Leader); John Greenhalgh, Greenhalgh Associates, UK; Leo Grutters, C2S Global, Germany; Aisha Nadar, Advokatfirman Runeland AB, Sweden; William Godwin, Matrix Seminars, UK; Siobhan Fahey, Consulting Engineer, Ireland (Contracts Committee liaison); and Shelley Adams, EIA Ltd., UK (secretary to the task group). The preparation was carried out under the general direction of the FIDIC Contracts Committee: Philip Jenkinson, Atkins, UK (past Chairman); Zoltán Záhonyi, Z&Partners Consulting Engineers, Hungary (Chairman); Vincent Leloup, Exequatur, France; Kaj Möller, SWECO, Sweden; Siobhan Fahey, Consulting Engineer, Ireland; Mike Roberts, Mott MacDonald, UK; Des Barry, Consulting Engineer, Ireland; Christoph Theune, GKW Consult GmbH, Germany; Enrico Vink, FIDIC Managing Director; and Christophe Sisto, FIDIC Design & Edition Manager. together with liaisons to the FIDIC Contracts Committee: Geoff French, Scott Wilson, UK (past EC liaison); Kaj Möller, SWECO, Sweden (past EC liaison); José Amorim Faria, SOPSEC, Portugal (past EFCA liaison); William Howard, CDM Smith, USA (EC primary liaison); Aisha Nadar, Advokatfirman Runeland AB, Sweden (EC secondary liaison; and Pawel Zejer, AECOM, Poland (EFCA liaison). Advisory Notes to Users of FIDIC Contracts Where the Project is Using Building Information Modelling Systems were provided by: Anthony Barry, Aurecon, Australia (FIDIC Executive Committee), Andrew Read, Pedersen Read Consulting, New Zealand (chairman FIDIC Business Practice Committee) and Stephen Jenkins, Aurecon, New Zealand (chairman FIDIC Risk, Liability and Quality Committee). Special Advisers to the Contracts Committee provided invaluable and continued support in the various drafting and revision stages: Christopher Seppälä, White & Case LLP, France (legal adviser, assisted by Dimitar Kondev, White & Case LLP, France); Nael G Bunni, Ireland (risk and insurance adviser); Axel-V. Jaeger, Germany; Michael Mortimer Hawkins, UK/Sweden; and Christopher Wade, UK. Drafts were reviewed by many persons and organisations, including those listed below. Their comments were duly studied by the FIDIC Contracts Committee’s Updates Special Group and Update Task Groups and, where considered appropriate, have influenced the wording of the clauses. Mahmoud Abu Hussein, Dolphin Energy, United Arab Emirates; Ihab Abu-Zahra, CRC Hassan Dorra, Egypt; Mushtaq Ahmad Smore, Engineer, Pakistan; Richard Appuhn, Engineer, Italy; Ulrik Bang Olsen, Bang Olsen & Partners Law Firm P/S, Denmark; Hartmut Bruehl, Engineer, Germany; Donald Charrett, MTECC, Australia; Edward Corbett, Corbett & Co International Construction Lawyers Ltd, UK; Cremona Cotovelea, SCPA Tecuci-Paltineanu, Romania; Mark Etheridge, UWP Consulting Pty (Ltd), UK; European International Contractors, Berlin, Germany; Ciaran Fahy, Engineer, Ireland; Stephane Giraud, Egis, France; Karen Gough, 39 Essex Chambers, UK; Sarwono Hardjomuljadi, Special Adviser to the Minister of Public Works, Indonesia; Sebastian Hoek, Kanzlei Dr.Hök Stieglmeier & Kollegen Berlin, Germany; Tomohide Ichiguchi, JICA, Japan; Reza Ikani, Tehran Berkeley Group of Companies, Iran; Levent Irmak, MC2 Modern, Turkey; Gordon Jaynes, Lawyer, UK; Nabeel Khokhar, Driver Group, UK; Humphrey Lloyd, Queen Mary University London, UK; Liu Luobing, Shanghai SICC Planning & Architectural Design, Republic of China; Husni Madi, Shura Construction Management, Jordan; Malith Mendis, ACES, Sri Lanka; Benjamin Mellors, Holman Fenwick Willan LLP, UK; Christopher Miers, Probyn Miers, UK; Henry Musonda, Kiran & Musonda Associates, Zambia; Kjeld B Nielsen, Sweco, Denmark; Patrizia Palmitessa-Savric, Ginder Palmitessa Pty Ltd, Botswana; James Perry, PS Consulting, France; Mikko Pulkkinen, Presentio Oy, Finland; John Ritchie, Consultant, Canada; Munther Sakhet, Allied Planning & Engineering Co, Jordan; Michael Sergeant, HFW, UK; Christian Siemer, Fichtner Consulting Engineers, Germany; Evgeny Smirnov, EBRD, UK; Jakob B. Sorensen, M Holst, Advokater, Denmark; Benjamin Valloire, Syntec Ingénierie, France; Kitty Villani, Council of Europe Development Bank, France; Ahmed Faty Waly, WALY Arbitration, Egypt. Acknowledgement of all reviewers above does not mean that such persons or organisations approve the wording of all clauses. FIDIC very much appreciates the time and effort devoted by all the above persons. The ultimate decision on the form and content of the document rests with FIDIC. Conditions of Contract for Works of Civil Engineering Construction. Part I: General Conditions with forms of tender + agreement; Part II: Conditions of particular application + guidelines for preparation of Part II clauses. (4th Edit. 1987, reprinted 1988 with editorial amendments, reprinted 1992 with further amendments, reprinted 2011). The 2011 reprint now also includes the Supplement 1st. Ed. 1996. 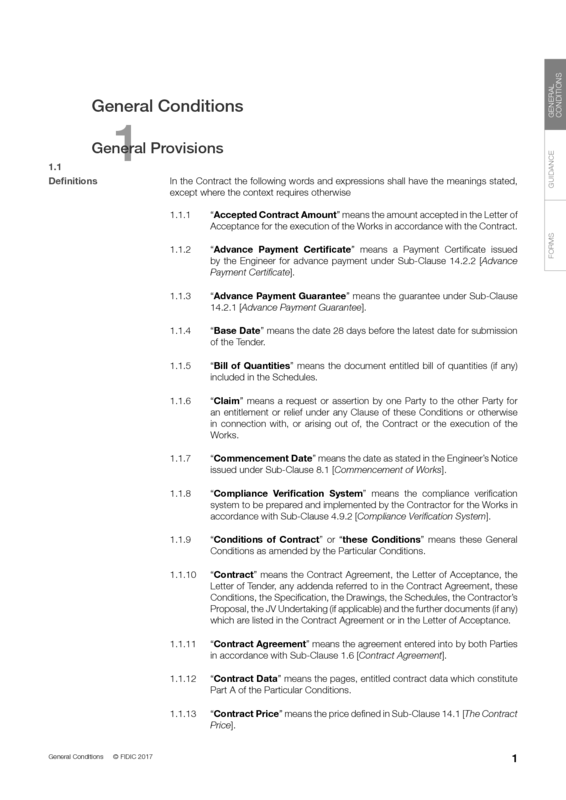 Users wishing to incorporate the part 1-General Conditions are invited either to include a printed version of the entire 2011 reprint or to purchase an electronic version, where Part1-General Conditions can be printed as a separate document. 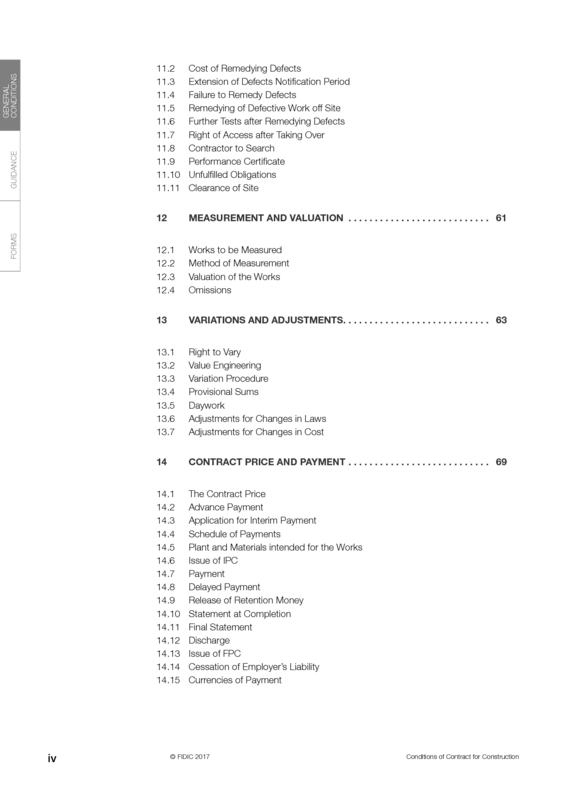 Conditions of Contract for Works of Civil Engineering Construction (3rd Edit. 1977). With forms of tender and agreement.